Some people say that if you're setting up your display aquarium for the first time, it's fine to just directly add in your new fish for "quarantine." Don't do it! 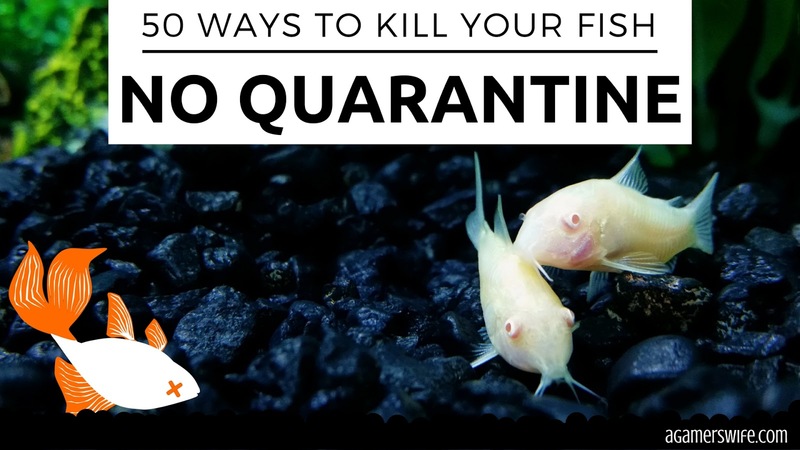 The whole point of quarantine is to keep your new creatures away from the main tank to prevent cross-contamination. Ideally, the quarantine tank should be in a completely separate room from any display tanks since germs can travel through air and water particles. 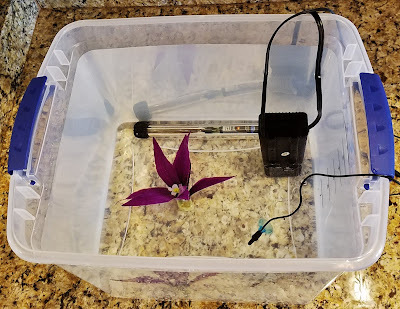 If your fish get sick while being quarantined in your main tank, it can pretty expensive to medicate the entire aquarium (compared to a smaller quarantine tub). Plus, you may have to bleach everything in the tank, throw out whatever can't be disinfected, and start the beneficial bacterial cycle again. It's not worth your time and money! Treat your main display tank like Fort Knox and don't let anything nearby that doesn't have the proper security clearance. My story is that I put two new albino corydoras straight into my main tank as the first residents and then a couple of days later, I added a third one to slowly increase the size of their school. I figured since they all went in around the same time, they could be in "quarantine" together. The third cory catfish started acting listless and eventually died a few days later. I freaked out and realized that a) my other two catfish might also die and b) the whole tank was exposed to whatever the dead fish had and I had no idea how to disinfect an entire tank. Luckily, the third catfish did not have any infectious diseases and the first two corydoras escaped unscathed. 2) "But the Fish Were Already Quarantined by the Seller"
Trust no one. Not even your friend swears that the fish he's giving you are disease-free. Not even that super reputable seller who already quarantines any fish she imports. It may sound overly cautious, but a) people lie and b) fish can get stressed from shipping and handling. Stress lowers a fish's immunity and can bring out diseases in normally healthy specimens, so it's better to be safe than sorry! Don't quarantine fish in a planted aquarium or other setup that is difficult to clean. In my case, I had an empty planted nano tank and decided to quarantine a pregnant balloon molly in it since my quarantine tank was already occupied. Once the fry were born, I scooped them up into a breeder box that I put in my bigger main aquarium. Yeah, turns out the mama molly had columnaris and, via her infected fry, spread it to my entire community of fish. (╥_╥) To make matters worse, I didn't realize the mama molly was sick when she died. So I put my replacement male molly in the nano tank without cleaning anything because, well, it's hard to disinfect live plants. Guess what the male molly died of? Get a basic quarantine tank that only needs a filter, heater (for tropical fish), thermometer, and hiding spot. I don't use cycled filter media because many times the medication I'm using is going to kill the beneficial bacteria anyways. I just cram the filter with polyfil stuffing for mechanical filtration and toss the polyfil afterwards to avoid future contamination. With an uncycled quarantine system, frequent water changes are necessary, but having a bare-bottom tub right next to the sink makes them fast and painless. Anyway, that's my take on a proper quarantine setup. Good luck and keep on swimming! Follow the rest of this series: 50 Ways to Kill Your Fish.